This striking 1960's style building stands on the corner of S. Beverly Drive and Pico. The office suite, which is on the 6th floor, is newly built and designed specifically for therapy practice, with sweeping views of Los Angeles that provide lots of natural lighting and an airy feel. Currently, there are offices which are furnished and available by the day or by the hour. There will be a full time office available in March. Fell free to come by and see the place. For rental information call Larry at 310.492.5005. 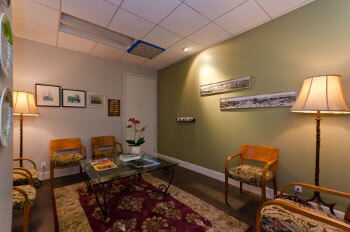 The ample sized waiting room is art-filled and has a semi-private exit. Each office has sound proofed walls, wifi and wired internet, and is linked to the call-light system. The hallways, like the rest of the suite, also enjoy natural lighting and are wide enough for two people to walk side-by-side.